The below chart from Rutgers University Professor Clinton Andrews sums it up. Clearly, the more land used, the more disruptive to ecosystems an energy source is, to the point that electricity from biomass would eclipse all current human use of land and use 60% of the earth's total land area in order to produce 100% of global demand. Wind land use to produce 100% of global demand would be par with all worldwide land area currently used for crops. 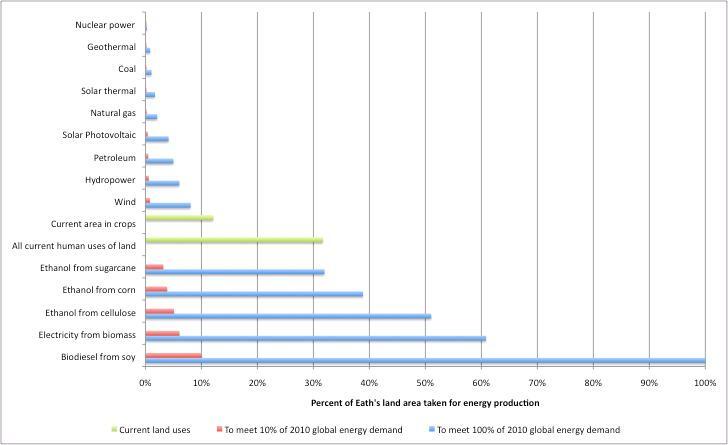 Percent of Earth's land area taken for energy production for different energy sources. Taken from: Alternative Energy and Land Use paper from Clinton Andrews et al. Land intensiveness data from McDonald et al (2009), land area data from Melillo et al (2009), global energy demand data from EIA. I was working on economic research for a Bio-mass to Electricity plant in the Midwest. I calculated that we would need about 10,000 acres for a 30MW plant. I was hoping to use "waste" land for this purpose. However the capital cost of the project combined with low marginal cost for electricity sunk the project. Point being that the amount of land needed for even a small amount of electricity generation is vast. Nuclear is much much better! A Small to Medium reactor can produce the same amount of power in an acre of land. Except the footprint of wind is actually a few dozen square meters per hectare: you get to use the land under the turbine for agriculture, grazing, forest, etc. Wind turbines don't actually take the land they use. Ignoring the second order effect; wind -wind interaction, you arrive at such conclusions.